Here’s something I’ve never actually seen in an online tournament before – a player who was left with exactly one chip after losing an early all-in confrontation. This is extremely rare, and with blinds starting at 20/40, it will almost never happen on the first level. 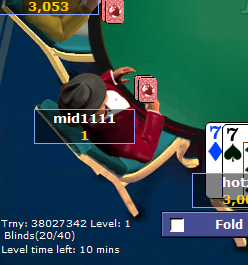 Get into a three-way all-in situation on the very first hand. Make sure there’s enough dead money that the pot won’t divide evenly by 3, and make sure you are out of position so you receive the extra chip. Pushing from the small blind and forcing the big blind out will do; that 40 chip big blind splits nicely into 14/13/13. In this case, everyone held a J on a 9TQK board. Never mind that it’s not the nuts, you can’t wait around that, just get all your chips in if the opportunity presents itself. Now that you have exactly one more chip than another player, you just need to get it all-in against him and lose. Make sure nobody else that covers you is in the pot too, otherwise you’ll either bust out or finish with two chips instead of one.